It is very important to maintain your battery regularly. A battery contains corrosive and potentially dangerous compounds. A nearly-drained battery runs the risk of leaking and damage beyond repair. An over-charged battery runs the risk of exploding. Besides these risks, a well-maintained battery can give you optimum performance and have a much longer life than a neglected battery. At SF Sonic, our engineers take every precaution to ensure the longevity, efficient performance and structural integrity of your battery, they also take care to implement regulation and extra safety measures in your battery. Every inverter battery comes with a description of how much wattage or power consumption it can support. An inverter battery if connected to more loads than it can support can drain rapidly and get damaged. It may also damage the equipments it is connected to. Excess heat produced may damage the circuits as well. Always connect to appropriate appliances or within the battery’s capacity. When topping up your inverter battery with distilled water, ensure that you have turned off the power source. If you don’t, you might get a nasty shock! Also avoid mineral water as it might reduce your battery’s efficiency. 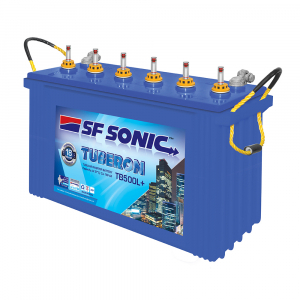 SF Sonic inverter batteries are equipped with very useful electrolyte indicators, so you will inevitable know when to top up. Wiring is essential for the longevity and efficiency of your battery. Please ensure that it wired only to those appliances that you wish to use with your inverter and that they are within the battery load limits. It is always better to see that the wiring is leak proof and well insulated. One of the most important measures for inverter battery maintenance is to ensure that the battery terminals are periodically checked to prevent accumulation of insulating waste. A crust covered terminal can cause loss of power, excess heat and possibilities of short-circuits. Clean the crust with your inverter turned off. Use petroleum jelly to prevent further crust formation. Avoid using soap water as soap can form crusts easily. Baking soda is recommended while cleaning. A soft toothbrush should be used while removing the crusts to prevent wear and tear. If a battery is fully charged but not used regularly, its efficiency decreases as chemical reactions continue to take place within it. It is recommended that once every month or a fortnight, you should discharge your battery completely and then recharge the battery. This will enhance the life your battery. Besides these useful tips, ensure that your battery remains free from dust, moisture, dampness and remains out of the reach of children in a well ventilated location. Purchase your SF Sonic inverter batteries online and enjoy a low-maintenance and hassle-free experience even during long power cuts! Previous Previous post: ISL 2015 Finale – Who will get crowned?